Oil spots- if you have a vehicle that may leak oil, try to clean the areas with a degreaser such as simple green and water. Vegetation- weeds/grass that may grow through small cracks in the pavement can deteriorate your asphalt surface. Weed/grass killing and edging grass over growth can prolong the life of your pavement. 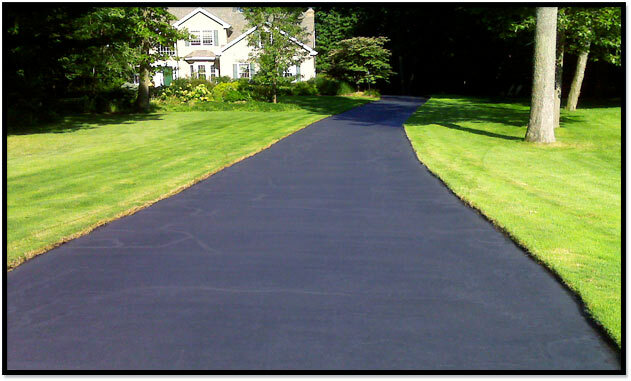 Over Sealing- Sealcoating a residential driveway should only been done once every 3-5 years depending on wear and tear. Over sealing can lead to cracking and flaking of sealer. Cracks- Crack sealing prevents water from reaching sub base. Most driveway damage in our climate is caused by frost heave from water getting under the pavement. When cracks appear, make sure you address them accordingly. Small cracks lead to larger ones if not properly filled. Tree roots- If you plan on installing a new driveway, try to cut down and remove any large trees within 5-10 ft of the driveway. Roots will eventually grow causing pavement to shift and crack. Drainage- Large amounts of water running alongside or under your driveway will cause failure in asphalt. If the base is washed out, asphalt will collapse and break. Sometimes a simple redirection of water from you yard can triple the lifespan of your driveway.